Do you have a 'Stinky Garbage Disposal? Don't feel bad, it is a common problem. What is better is that you can fix the problem without too much trouble. The kitchen is where the food is prepared and having foul odors is the last thing we want. 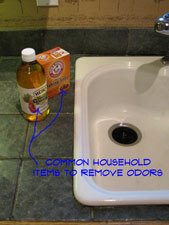 There are things that can be done to prevent odors and smells, most of them very simple. There are other things that can be done once odors have developed. When food rots, it smells. Food that gets left over inside of the disposal is going to rot and eventually smell. Proper usage and periodic maintenance will likely eliminate the problems. You don't have to live with foul smells. What Can You Save? - This is not something that you would normally call someone for. If you did, it would likely be a service call, between $50 and $75. The odor can be a bother, fortunately there are easy ways to take care of it. How Hard Could It Be? - dealing with a stinky garbage disposal is not a hard job at all. These repairs will have a Difficulty Level of: Simple. These repairs require a Skill Level of: Total Novice. For and explanation of the terms in this section, see 'How to Use This Site'. Check the Simple Things! - This is already a fairly simple problem. See the information below for the best practices in dealing with this unwanted odors. For other garbage disposal issues, see 'Repairing a Garbage Disposal', for more information. What Can Go Wrong? - Not dealing with this problem in a timely way can lead to deeply entrenched odors. When this happens they will be harder to get rid of. Nothing worse than going to prepare a meal and you have a bad smell in the kitchen. The cause of garbage disposal odor should not be a mystery. The purpose of a disposal gives it away. Rotting food smells and bad smells from the disposal mean rotten food. The garbage disposal grinds up food waste. Odors come from food waste that has not been washed down the drain. It may seem like good economic sense to shut off the water as soon as the food is ground up. However, this may leave food on the sides of the disposal that later begin to rot. The rubber baffle is another place that food waste can collect, especially the under side of it. The water does not rinse it and the grinding action of the disposal throws bits of food up onto it that stick to the baffle. In addition, the garbage disposal has other nooks and crannies that food can stick to. When these bits and pieces of food start to rot, you get odor. The amount of food and the length of time will affect how much odor. Make it a practice to run water after the food is ground up. See the section below on proper garbage disposal maintenance. If a 'commercial garbage disposal cleaner' does not appeal to you, there are other options. One would be to clean the garbage disposal manually with old fashioned soap and water. This an effective but low tech method. Before you begin make sure that power to the disposal is off. Don't just trust the switch, unplug it or shut the breaker off. You will need a stiff brush with a long handle and a smaller brush to clean the rubber baffle. An old tooth brush will work for the smaller brush. Mix some dish detergent with warm water and scrub the inside of the disposal thoroughly with the long handled brush. Make sure the sides of the disposal are cleaned thoroughly. Try to get the brush up under the rim and scrub that area as well. 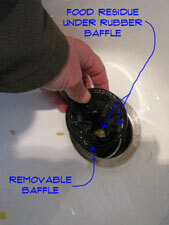 Many garbage disposals have a fixed baffle that cannot be removed. Flip back the rubber and scrub the underside with the small brush. Continue pulling up the baffle until you have the entire underside cleaned. Scrub the grinding cutters and bottom plate with the long handled brush. Try to move it around and get the perimeter completely cleaned. The cutters move around so make sure they are clean. This method requires a little elbow grease to accomplish. You have the satisfaction of knowing you are doing a thorough job. After you are done with the brush, plug the disposal back in. Run first warm water and then cold water through it with the disposal running. Repeat the process if you are still getting odor. This article covers a couple of home remedies for removing garbage disposal odors, stink and smells. Neither of these costs much and will work if the odors are not too severe. Do not use bleach or bleach based products to get rid of odor. Your disposal has several rubber seals that may be damaged by the bleach. Bleach can also react with other chemicals and create dangerous fumes. Other methods are just as effective and not as dangerous. One popular method for eliminating odor is to cut a lemon into quarters and put them in the disposal along with a couple of big handfuls of ice. Grind up the ice and lemons for several seconds and then let set. 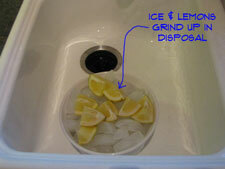 Run the disposal with warm water to finish grinding up the lemons and ice. Run plenty of water down the disposal. Repeat this process as needed or every few weeks to keep your disposal lemony fresh. This will prevent you from having a stinky garbage disposal in the future. Another thing to try, would be using a oxygen based cleaner like Oxy Clean. This cleaner is fairly safe and bio degradable. With a little water it will produce a foam that will also kill odors. Another suggestion is to dump excess water with Oxy Clean in it down your disposal. Make this a habit and your odor problems will be reduced. One other home remedy is to use a liberal amount of baking soda and a cup of vinegar. This is natural odor killing solution. Allow it to foam up and stand in your garbage disposal for 15 - 30 minutes. Rinse thoroughly while running the disposal. Repeat this process as needed until the odor is gone. There are several commercial garbage disposal cleaners available. They all claim to solve all your odor and cleaning problems. For a complete discussion on 'Cleaning a Garbage Disposal' and the products that can be purchased to accomplish it, follow this link. Regular cleaning can eliminate a stinky garbage disposal problem. Run plenty of water down your disposal. This will help to wash away food particles that can later decay. Let the water run after all of the food has been ground up. You can also pull the rubber strainer out and rinse the disposal out with the spray attachment on your faucet. Plenty of water and some occasional disinfectant and your disposal will always smell sweet. In this article we covered the main cause fro a stinky garbage disposal, decaying food. We also talked about some things you can do without spending a lot of money to rid yourself of the smell. We covered some methods for removing the smell and provided a link to an article on giving your disposal a professional cleaning. Lastly, we talked about some preventative maintenance and good practices that you can do on a regular basis.